A genealogical query late last week had me skimming the archives a bit during my free moments over the weekend. I didn't come up with exactly what I was looking for yet -- that computer room move and all the rearranging comes back to bite me every now and then (though I'm still glad we did it and I wouldn't change a thing). The inquiring minds belong to Char, a first-cousin-once-removed, and her son (my second-cousin) on my paternal grandmother's side. They're looking for better copies of some photographs -- from her description, I know exactly which photos they are and I pass some of them every day, every trip that I make up or down the stairs -- old photos that I borrowed from my grandma several years ago; DH and I made copies -- some 4x5 transparencies, some slides, some digital -- my grandma must have given Char photocopies. I did come up with a couple of photos to keep Char happy while I search for the others -- one of my grandma and her three younger brothers on their parents' farm in central Wisconsin, ca. 1920. One of the boys is Char's dad. It is one of my favorite photos ever -- they look so happy. Even if my grandma wasn't tallest, you can tell that she's the eldest, can't you? Standing there, watchful, hands on hips. I know it isn't going to surprise you one single bit that she was a teacher before marrying and having a family of her own. I am often compared to her -- a comparison I welcome gladly; listening to a fairly good recording of myself a year ago (not on an answering machine), I was shocked to hear how much I sound like her, too. 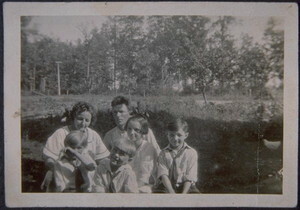 The other photo is a few years later, the whole family. I have pulled the red holding yarn in one of the mittens to pick up stitches for the thumb, but was a bit hasty and have a little bit of a mess on my hands. I didn't think I'd be so confused by the strands that were carried along in the back, but I am. I have enough stitches on the bottom, but not on the top. I ended up stopping with the knitting and giving full attention to Running With Scissors last night, but tonight I'll be a little more careful in picking up the stitches on the second mitten, in hopes that it will give me some idea of what I'm supposed to have on the needles for the first. Ack. Joseph Cross reminds me so much of Bob Crane -- very young and more adorable, but every time I saw him last night, I thought, "He looks like a young Bob Crane." (Not to be confused with Denny Crane.) Is it just me? I just LOVE all of your old photographs. Thank you so much for sharing them. I love those old photos, Vicki. What a treasure. Great photos! You're so lucky to be so connected to your family that way. You'll figure out that mitten I'm sure and man yes! He does look like a young Bob Crane! Bet you saw that pose lots of times while growing up. What a treasure to have a photo of her as a young person. When I was little, I found it so hard to think of my mother or grandmother as a child or young woman; funny now to be "middle aged" and realize others see ME that way. 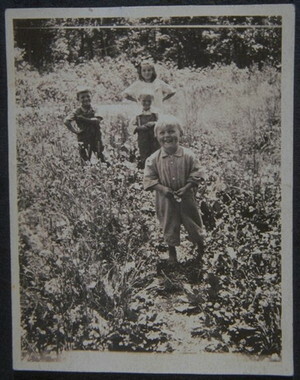 I love the perspective in the photo of your g'ma and her siblings in the garden. (and the obvious joy on all their faces.) Despite the coloration, I would have almost taken that as a modern photograph taken with a fancy camera. Do you know who took the photo? I wouldn't be surprised if it was a blood relative of yours. 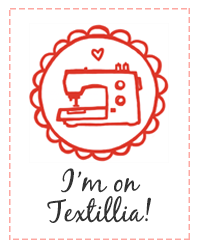 I'm thinking perhaps the stitch count is going to be one off between the top and bottom due to the fact that you're picking up stuff *between* stitches on the top, and thus will have n-1 instead of n stitches. (Where n is the number of stitches you're expecting.) If you need the same number of stitches on both, create one at either side of the opening. If you're off by two, then that's a problem. Just catching up, you have been very busy, your old photos are fantastic, hope you had a fun visit with Mack and I can't wait to see your mittens finished. Try and insert your needle (even go down one size for this part of it)into the stitches BEFORE you rip out the waste yarn. I do an "afterthought" heel on my socks all the time and this is the way I do it. It would give you a better opportunity to "see" the stitches you need on the needles. They will be lovely without a doubt! !